Joey Barton hopes Rangers loan star Jason Holt has not played his last match for Fleetwood Town after being stretchered off in the victory at Accrington Stanley. The midfielder left the field injured in the 14th minute of Town’s 1-0 win at Wham Stadium. The Town boss, who said his players won the game for the Scot, hopes for positive news from Holt’s scan but is fearful the 26-year-old could miss the final seven games of the League One campaign. Barton said: “I don’t want to speculate but I’ve been there and made those tackles as a player – it usually opens up your medial ligaments. “You don’t ever want to see a player stretchered from the pitch but hopefully it is the better side of whatever we think it is. If it is the worst side, then it probably puts him out for the season. “He has been outstanding for us – a real team man, team player. “I said in the dressing room at half-time, ‘Let’s make sure we get the three points for Jason. Barton made one change to the side that beat Plymouth Argyle 2-0 a fortnight earlier, with Ash Eastham moving to the bench and James Husband stepping in. 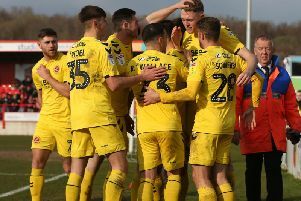 That saw match-winner Harry Souttar start in the middle of the back three, though Eastham did enter the fray in the 59th minute to help Town keep a 15th clean sheet of the term. Barton explained the selection. “I wanted to get a bit of balance into the team. A left- footed centre-half does help,” he said. “We have not got a recognised left-footed centre-half. “Coming off a 2-0 win over Plymouth, you do not want to change it. “But I’ve said before I will change the team if I think it gives us a better opportunity of winning games. “Ash was really unfortunate to miss out but he gets on the pitch and plays a vital role in us taking a clean sheet and three points. “The key for me is getting that consistency. Regardless of team selection, it is about getting a consistent basis that we can play off. Town climbed a spot to 10th and remain eight points behind Doncaster Rovers, who occupy the final play-off spot and have played a match more.